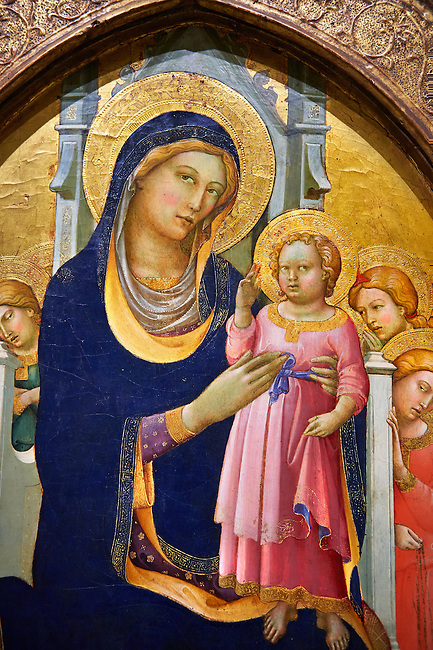 Gothic Altarpiece of Madonna and Child enthroned with angels byPero di Giovanni known as "Lorenzo Monaco" of Sienna and Florence, circa 1415-1420, tempera and gold leaf on wood. National Museum of Catalan Art, Barcelona, Spain, inv no: MNAC 212808. The Virgin Mary is seated with the child standing on her lap, in an attitude of blessing, accompanied by angels with incentives. The composition is very simple and fuses Sienese and Florentine pictorial traditions in the style of Lorenzo Monaco, monk of the convent of Santa Maria degli Angeli in Florence and the last representative of the style of Giotto before the Renaissance revival of Fra Angelico.